Aim: To evaluate electrical conductivity of the medium provided with ModuPRO endodontic modules, and compare it with those of alginate and vinyl polysiloxane impression materials over varying time intervals. Materials and Methods: A 24 Real Endo-t teeth were mounted in the ModuPRO Endo™ modules using three different mounting media [Groups A (Apex Putty), B (alginate), C (extra-light body vinyl polysiloxane)]. The working lengths were predetermined by microscopy, and the root canals were prepared with ProFile rotary instruments before mounting. Working lengths were checked with an electronic apex locator at 24 and 48 hours; 1, 4, and 6 weeks; and 6 months. Data were analyzed using one-way analysis of variance (ANOVA), the Tukey-Kramer multiple comparison tests, and the Wilcoxon Signed Rank Sum test, with significance set at P < 0.05. Results: Group C showed higher measurements and significant differences from groups A and B for up to 6 weeks (P < 0.05). There was no difference between groups A and B (P > 0.05). After 6 months, all groups showed significantly higher working lengths from those predetermined, but no statistically significant differences were observed among them (P > 0.05). For all groups, differences from predetermined working lengths were lowest at the 1-week interval. Conclusions: Both alginate and the Apex Putty can be used for determining the working lengths using an apex locator over a longer time period. Our study has shown that ModuPRO Endo™ modules, along with the Apex Putty, are effective tools for teaching working length determination with apex locators in preclinical endodontic training. تهدف هذه الدراسة لقياس مدى التوصيل الالكتروني للمادة الموصلة التي تتوفر مع منتج الموديو بروو والتي بدورها تفيد في قياس دقيق لأطوال الأسنان ومقارنته مع مواد أخرى مثل الالجينيت وفينيل بوليسالوكسين خلال فترات زمنية مختلفة. تم استخدام 42 سن ريل إندوا وتم تثبيتهم في قالب الموديو بروو باستخدام الثلاث المواد المشار إليها، بعد ذلك تم تحديد طول الأسنان بالمجهر وتحضير القنوات ومن ثم تم تحديد طول السن إليكترونيا بعد 42 و 84 ساعة. وبعد ذلك بأسبوع، 4 أسابيـع، و 6 أسابيع وأخيراً بعد ستة شهور. أثبتت هذه الدراسة أن مادة الألجينيت والأبيكس باتي يمكن استخدامها لقياس طول الأسنان بواسطة المقياس الالكتروني. Dental Schools' curriculum is based upon a student's competency to absorb most of the theoretical knowledge acquired during the basic courses and assimilate them with manual skills developed during preclinical courses. These efforts enable the student to face both diagnostic and therapeutic challenges encountered in the final clinical courses. Because dental students are introduced to patient care at an early level, much emphasis must be placed on preclinical training. It must be meticulous and elaborate, and it must physically and mentally prepare the student to transit comfortably into the clinical setting. Many reports have emphasized the importance of comprehensive endodontic training on eventual treatment outcomes of root canal procedures performed by dentists. ,,, Endodontics educators face the challenge of providing students with the most clinically accurate study models that enable the students to understand the nuances involved in root canal therapy. Thus, there has been a huge transition from using human cadaver sections and bovine mandibles , to sectioned extracted teeth,  transparent decalcified teeth,  direct visualization through plastic tubes,  curved resin simulated canals,  and extracted natural human teeth. Extracted teeth mounted in plaster have been, by far, the most popularly used study models in preclinical dentistry. One of the biggest challenges faced with resin blocks or extracted teeth is the inability to train the students in the use of electronic apex locators (EALs), so they rely solely on radiographic techniques of working length determination. Recent studies have shown that the use of EAL in concomitance with digital radiography is an essential combination for a successful working length determination. ,, To achieve a better clinical simulation, the extracted teeth have been mounted in modified acrylic models that can be fitted onto standalone acrylic models or dental phantom heads, which enable the use of EALs. , Recently introduced are the ModuPRO Endo™ modules [Acadental, Overland Park, Kansas, USA], which are now popular for endodontic training. The ModuPRO Endo™ Modules along with the Real Endo Teeth (with simulated root canals) have been promoted as a promising entity for preclinical endodontic training. ModuPRO Endo™ has Modules/sextants onto which typodont teeth [Real Endo-T teeth] with simulated root canals can be mounted. The modules have magnetic strips on the base that can be attached to a carrier tray. The teeth are mounted into the modules with a mounting media comprising Apex Putty [Acadental, Overland Park, Kansas, USA], and an Automixing Fixing gel [Acadental, Overland Park, Kansas, USA]. One of the most important features of this product is the possibility of using an Apex locator while training on the typodont teeth. These modules enhance the student's practice, especially with regard to indirect vision, application of the rubber dam, and use of apex locators. Mounting of those teeth takes place at the beginning of the preclinical endodontic course, which usually extends over a period of 3 months. However, there are no studies corroborating the effect of time on the conduciveness of the medium provided by the manufacturer to be used for mounting the teeth in the modules. Thus, the aim of this study was to evaluate the electrical conductivity of the medium provided by the manufacturer, and compare this medium with other commonly available dental materials, like alginate and vinyl polysiloxane impression materials, over a period of various time intervals. Twenty-four Real Endo-T teeth [Acadental, Overland Park, Kansas, USA], with simulated root canals for Endodontic training in the preclinical endodontic course were used for the study. All the teeth were access opened and the cusps were reduced to make a stable reference point for working length determination. 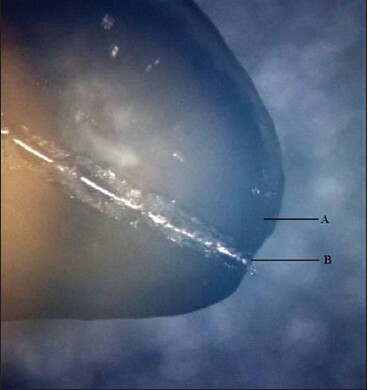 Working length was determined by introducing a size #10 K-file [Mani Inc., Utsunomiya Tochigi, Japan] in the canal until the tip of the file was visible at the root apex [Figure 1], which was visualized under a stereomicroscope at 1.5× magnification [Nikon SMZ 800, Japan] and the undersurface of the stopper was adjusted to coincide with the flattened buccal cusp. The length was noted using Digital Vernier Callipers [Clarke - Precision, England], and working length was established to be 0.5 mm short of this length. The teeth were then preflared using ProFile rotary instruments [ProFile® Dentsply Maillefer, Ballaigues Switzerland] to size 20 [04 taper] up to 3 mm from the apex using a rotary endodontic machine [X-Smart™ endodontic motor, Dentsply, Ballaigues Switzerland] under copious irrigation with sodium hypochlorite solution. The rotary file was introduced to desired length twice without brushing motion on the walls. The apical third of the canal was prepared using stainless steel hand files to a size #20. For the purpose of standardization, all preparation procedures were done by one operator. After preparation, the teeth were divided into three experimental groups of eight teeth each, and mounted into the ModuPRO Endo™ modules using the respective conducting media for each group and the fixing gel supplied by the manufacturer. Group A: The conducting media used was the Apex Putty that was supplied by the manufacturer. Group B: The conducting media used was alginate [Italgin Chromatic Alginate - BMS Dental, Capannoli, Italy]. Group C: The conducting media used was extra-light body vinyl polysiloxane impression material [Virtual-Ivoclar Vivadent, New York, USA]. The teeth were mounted following the manufacturer's instructions. Conductive media was first introduced to cover one-third of the modules and the apical third of the root. The remainder of the module was filled with the Automix Fixing gel provided by the manufacturer, to the level of the cervical third of the crown of the tooth (corresponding to the cemento-enamel junction of the natural teeth). The teeth were then randomly numbered by an investigator who was blinded to the different experimental groups and the working lengths were established using a size 20 K file and an EAL [Root ZX II® J Morita, California, USA] at various time intervals. The canals were always filled with 1% sodium hypochlorite during the working length determination, and the working length was noted when the indicator on the LCD display of the Root ZX II stopped at a point designated to be 0.5 mm from the apical constriction. At this point, the silicone stopper was adjusted at the occlusal reference point and the measurement was taken from the lower surface of the stopper to the tip of the instrument using the Digital Vernier Callipers, which was corrected to hundredths of a millimeter. The measurements were taken at 24 and 48 hours; 1, 4, and 6 weeks; and 6 months. The data were analyzed using Kruskal - Wallis one-way analysis of variance (ANOVA) and the Tukey - Kramer multiple comparison test, with significance being considered at P < 0.05. Measurements at different time intervals within each group were compared using Wilcoxon signed rank sum test at significance level of P < 0.05. Working length measurements were higher than the predetermined lengths for all tested materials [Table 1]. In Group C (vinyl polysiloxane), readings were more than ±3 mm different at all the time intervals. 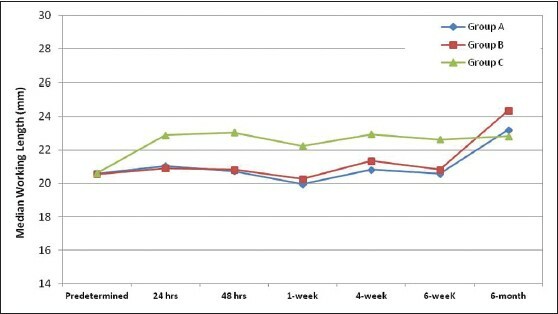 Group C (vinyl polysiloxane) showed higher measurements and differed significantly from Groups A and B at 24 and 48 hours; and at 1, 2, 4, and 6 weeks (P < 0.05). There was no statistically significant difference between groups A and B (P > 0.05). After 6 months, all groups showed significantly higher measurements with no statistically significant differences between them (P > 0.05). The mean working length of specimens at various time intervals [Table 1] showed that in Group A and Group B the measurements obtained were beyond the predetermined working lengths for 24 hours, 48 hours, 4 weeks, and 6 weeks intervals except the 1 week interval, where the measurements were found to be less than the predetermined working lengths. The median difference in working lengths obtained from Groups A and B when compared with the predetermined working length showed a variation in the measurements from −0.6 to +0.5 mm and −0.3 to +0.7 mm, respectively, for measurements up to 6 weeks [Table 2]. The variations in the working length are represented more clearly in the line graph [Figure 2] wherein, Group C shows measurements which are significantly higher than the other groups while Groups A and B showed more or less similar variations for all time intervals except for the 6 month interval. The most important benefits of EALs in endodontics are reduced radiation exposure and the ability to determine the apical foramen accurately with accuracy up to 90%. ,,,,, Since their introduction to endodontics, apex locators have undergone changes and developments with promising results and many new EALs have been introduced. Root ZX is one such EAL with accuracy rates between 90% and 100%. , Therefore, in this study, the Root ZX II was used as the Apex locator. In 2007, Baldi et al. demonstrated that alginate, due to its colloidal consistency and good electroconductive property, was a good embedding medium for testing apex locators. In our study, alginate also had good results, which support its use as a substitute for the manufacturer's material in ModuPRO Endo™ modules because alginate is easy to handle and has a low cost. Both the Apex Putty and alginate retained consistency as the conductive media was covered thoroughly by the fixing gel, which formed a hard resinous covering and thus prevented the desiccation of the mounting media. Materials that remain conducive over extended periods of time can facilitate prolonged use of these materials. The present study showed that ModuPRO Endo™ modules along with the Apex Putty can be considered effective tools for teaching working-length determination with apex locators in preclinical endodontic training. The authors express gratitude to Dr. Abdul Majeed and Mr. Intisar Siddiqui for their advice and discussion. 1. Qualtrough AJ, Whitworth JM, Dummer PM. Preclinical endodontology: An international comparison. Int Endod J 1999;32:406-14. 2. Barrieshi-Nusair KM, Al-Omari MA, Al-Hiyasat AS. Radiographic technical quality of root canal treatment performed by dental students at the Dental Teaching Center in Jordan. J Dent 2004;32:301-7. 3. Lynch CD, Burke FM. Quality of root canal fillings performed by undergraduate dental students on single rooted teeth. Eur J Dent Educ 2006;10:67-72. 4. Sonntag D, Bärwald R, Hülsmann M, Stachniss V. Pre-clinical endodontics: A survey amongst German dental schools. Int Endod J 2008;41:863-8. 5. Newton CW, Ferguson SA, Patterson SS. The use of cadaver sections in preclinical endodontic laboratory. J Dent Educ 1979;43:351-2. 6. Bramante CM, Berbert A, Modetli J. The use of bovine mandibles for teaching endodontic surgical skills. J Endod 1981;7:282-3. 7. Bence R. Direct visualization of endodontic techniques in extracted teeth. J Dent Educ 1974;38:565-7. 8. Hasselgren F, Tronstad L. The use of transparent teeth in the teaching of preclinical endodontics. J Endod 1975;1:278-80. 9. Fleisher RM, Heintz CE. A plastic tube technique for direct vision of endodontic procedures. J Dent Educ 1977;41:630-2. 10. Weine FS, Kelly RF, Lio PJ. The effect of preparation procedures on original canal shape and on apical foramen shape. J Endod 1975;1:255-62. 11. Hoer D, Attin T. The accuracy of electronic working length determination. Int Endod J 2004;37:125-31. 12. Kim E, Marmo M, Lee CY, Oh NS, Kim IK. An in vivo comparison of working length determination by only Root-ZX apex locator versus combining Root-ZX apex locator with radiographs using a new impression technique. Oral Surg Oral Med Oral Pathol Oral Radiol Endod 2008;105:79-83. 13. Tchorz JP, Hellwig E, Altenburger MJ. An improved model for teaching use of electronic apex locators. Int Endod J 2012;45:307-10. 14. V Nikhil, N Srivastava. A new pre-clinical "endodontic model": Boon to learners. Endodontology 2009;21:58-61. 15. Welk AR, Baumgartner JC, Marshall JG. An in vivo comparison of two frequency- based electronic apex locators. J Endod 2003;29:497-500. 16. Nattress BR, Manogue M, Carmichael F. A model for the teaching of clinical techniques in root canal treatment. Int Endod J 1997;30:343-6. 17. Camargo EJ, Ordinola Zapata R, Medeiros PL, Bramante CM, Bernardineli N, Garcia RB, et al. Influence of preflaring on the accuracy of length determination with four electronic apex locators. J Endod 2009;35:1300-2. 18. Ravanshad S, Adl A, Anvar J. Effect of working length measurement by electronic apex locator or radiography on the adequacy of final working length: A randomized clinical trial. J Endod 2010;36:1753-6. 19. Silveira LF, Petry FV, Martos J, Neto JB. In vivo comparison of the accuracy of two electronic apex locators. Aust Endod J 2011;37:70-2. 20. Vasconcelos BC, Matos Lde A, Pinheiro-Júnior EC, Menezes AS, Vivacqua-Gomes N. Ex vivo accuracy of three electronic apex locators using different apical file sizes. Braz Dent J 2012;23:199-204. 21. Paludo L, Souza SL, Só MVR, Rosa RA, Vier-Pelisser FV, Duarte MAH. An in vivo radiographic evaluation of the accuracy of Apex and iPex electronic Apex locators. Braz Dent J 2012;23:54-8. 22. Renner D, Grazziotin-Soares R, Gavini G, Barletta FB. Influence of pulp condition on the accuracy of an electronic foramen locator in posterior teeth: An in vivo study. Braz Oral Res 2012;26:106-11. 23. Stober EK, Duran-Sindreu F, Mercandé M, Vera J, Bueno R, Roig M. An evaluation of Root ZX and iPex apex locators: An in vivo study. J Endod 2011;37:608-10. 24. Hansen SW, Musanje L, Nguyen T, Kashkouli M. Evaluation of the ModuPRO for In-vitro Measurement of Electronic Length. Poster session presented at: The ADR/AADR/CADR 85th General Session and Exhibition 2007 March 21-24; New Orleans, LA, USA. 25. Chen E, Kaing S, Mohan H, Ting SY, Wu J, Parashos P. An ex vivo comparison of electronic apex locator teaching models. J Endod 2011;37:1147-51. 27. Nahmias Y, Aurelio JA, Gerstein H. An in vitro model for evaluation of electronic root canal length measuring devices. J Endod 1987;13:209-14. 28. Fouad AF, Krell KV. An in vitro comparison of five root canal length measuring instruments. J Endod 1989;15:573-7. 29. Ushiyama J. New principle and method for measuring the root canal length. J Endod 1983;9:97-104. 30. Weiger R, John C, Geigle H, Löst C. An in vitro comparison of two modern apex locators. J Endod 1999;25:765-8. 31. Leonardo MR, Silva LA, Nelson-Filho P, Silva RA, Raffaini MS. Ex vivo evaluation of the accuracy of two electronic apex locators during root canal length determination in primary teeth. Int Endod J 2008;41:317-21. 33. Czerw RJ, Fulkerson MS, Donnelly JC. An in vitro test of a simplified model to demonstrate the operation of electronic root canal measuring devices. J Endod 1994;20:605-6. 34. Guise GM, Goodell GG, Imamura GM. In vitro comparison of three electronic apex locators. J Endod 2010;36:279-81. 35. Miguita KB, Cunha RS, Davini F, Fontana CE, Bueno CES. Comparative analysis of two electronic apexlocators in working length determination at endodontic therapy - an in vitro study. RevistaSul-Brasileira de Odontologia 2011;8:25-9. 36. Kaufman AV, Katz A. Reliability of Root ZX apex locator tested by an in vitro model. J Endod 1993;19:201.Abstract n. 69. 38. Baldi JV, Victorino FR, Bernardes RA, de Moraes IG, Bramante CM, Garcia RB, et al. Influence of embedding media on the assessment of electronic apex locators. J Endod 2007;33:476-9. 39. Goldberg F, Frajlich S, Kuttler S, Manzur E, Briseño-MarroquínB. The evaluation of four Electronic Apex Locators in teeth with simulated horizontal oblique root fractures. J Endod 2008;34:1497-9. 40. Vasconcelos BC, Vale TM, Menezes AS, Pinheiro-Jr EC, Vivacqua-Gomes N, Bernardes RA, et al. An ex vivo comparison of root canal length determination by three electronic apex locators at positions short of the apical foramen. Oral Surg Oral Med Oral Pathol Oral Radiol Endod 2010;110:e57-e61. 41. Tselnik M, Baumgartner JC, Marshall JG. An evaluation of root ZX and elements diagnostic apex locators. J Endod 2005;31:507-9. 42. Wrbas KT, Ziegler AA, Altenburger MJ, Schirrmeister JF. In vivo comparison of working length determination with two electronic apex locators. Int Endod J 2007;40:133-8. 43. Cianconi L, Angotti V, Felici R, Conte G, Mancini M. Accuracy of three electronic apex locators compared with digital radiography: An ex vivo study. J Endod 2010;36:2003-7.